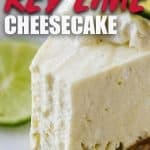 No Bake Key Lime Cheesecake-- The secret is in the Jello! 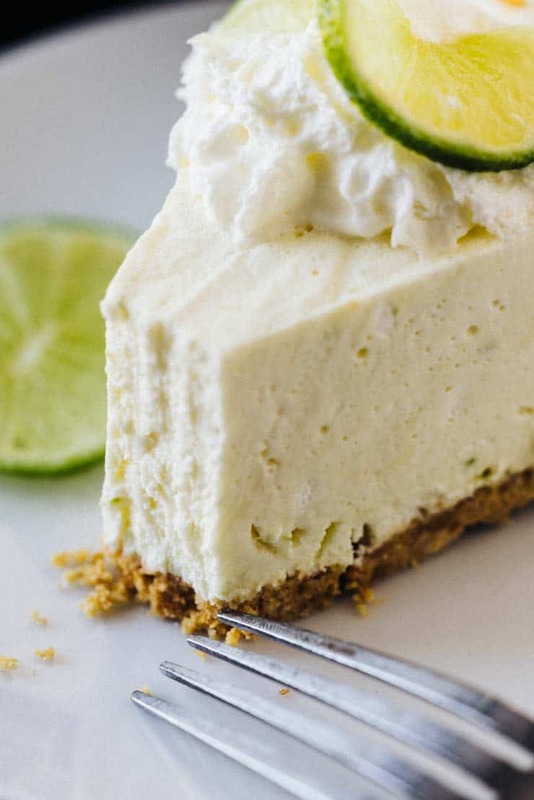 This no-bake key lime cheesecake is going to be your new favorite light and cool dessert! It takes just a few ingredients– one of them actually being lemon jello! Read on to find out why! I can’t resist posting this No Bake Key Lime Cheesecake today. While it may be cold, wet and/or snowy wherever you are on this winter’s day, this cheesecake will bring some good vibes and maybe just a glimpse of what summer will look like in your kitchen. Now, don’t get me wrong, I’m not asking you to wait until summer to make this recipe, but I do know it will make a mighty fine addition to your summer BBQs and get-togethers. Fresh key limes can be hard to find if they aren’t in season, so I use bottled key lime juice. It can be typically be found in the juice aisle on the top shelf in a pale yellow bottle. I’ve linked to the kind I use in in the “tools section” below. Don’t know the difference between key limes and regular limes? 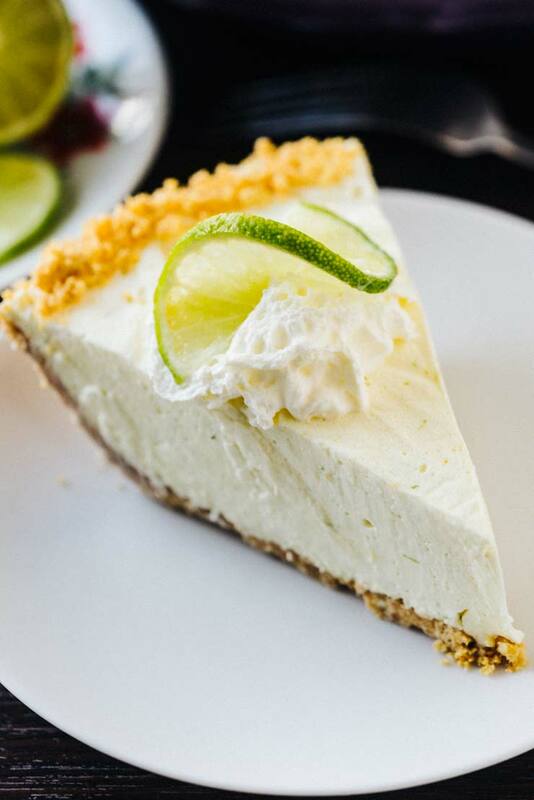 Key Limes have a tarter, more floral juice making them great for baking and desserts– hence the famous key lime pie! 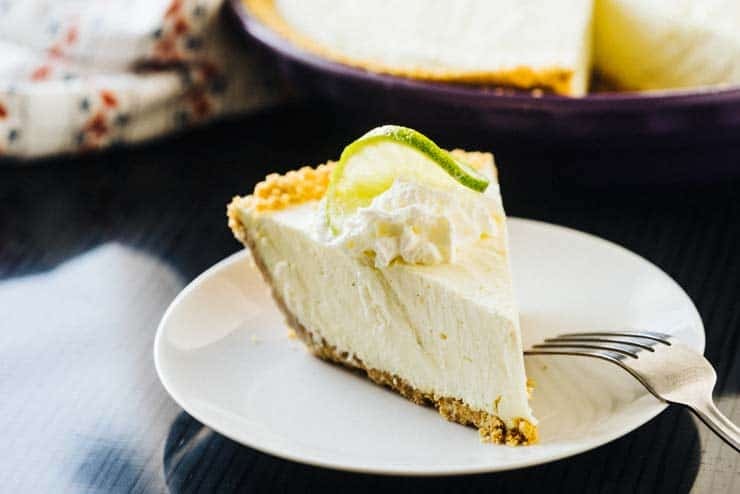 You can substitute normal lime juice in this recipe, just know the flavor will be a bit sweeter and different, than typical key lime pie. When making cheesecake (no bake or baked), it’s imperative that all your batter ingredients be room temperature. Doing this will ensure the cream cheese can be mixed into a super smooth batter with no lumps. Use a 10.5″ deep dish pie plate or 9×13″ pan for this recipe. If you try to use a standard 9″ pie dish, you’ll have more filling and crust than can fit. Want more simple dessert recipes? Nellie and Joes Key Lime Juice: A bottle of this will last at least a year in your fridge and longer if you freeze it into juice ice cubes. I love having it in my fridge to add to drinks and recipes when needed. 10.5″ Deep Dish Pie Plate: I used a pie plate similar to this one when making larger pie/dessert recipes. Flexible Pie Server: I received a flexible pie server as a wedding gift almost 14 years ago, and it’s still going strong! It makes taking that first piece of pie out of the pan a breeze! 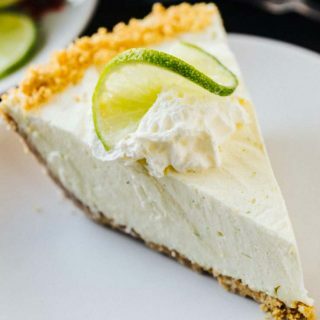 This no-bake key lime cheesecake is going to be your new favorite light and cool dessert! It takes just a few ingredients-- one of them actually being lemon jello! Read on to find out why! Combine graham cracker crumbs with sugar and butter in a bowl. Firmly press into the bottom and up the sides of a large 10.5" pie dish or into bottom of a rectagular 9x13" pan. Use the flat bottom of a glass to help even the surface and compact the crumbs. Pour lemon jello into boiling water and stir until dissolved. Place into refrigerator until cooled to room temperature. In a large bowl beat cream cheese with sugar, lime juice, lime zest and vanilla with an electric mixer until very smooth. Pour cooled jello (must be room temperature!) into the cheese mixture and beat until well combined. In a separate bowl beat heavy cream until medium-stiff peaks form. Gently fold whipped cream into the jello/cheese mixture and mix until combined. Pour into prepared crust and refrigerate until set-- about 2 hours. Serve chilled with whipped cream and lime wedges. I haven’t tried it, but I imagine it would work. If you try it, let me know how it turns out! I was surprised to see that you used lemon Jell-o. Would it work to use lime flavored or would that be too much? Just curious if you tried it both ways and found the lemon to be the best. I’ve found that lime flavoring is a little more pungent than the lemon and has a less natural color. The additional lime juice is just enough for that lime flavor to shine through with the help of the lemon jello.